We’ve talked about sportcoats before and how the right one can be an integral part of your wardrobe. We discussed a plain gray, 2 button, vented option to get you through most situations. Now, it’s time to switch gears and step out in something a little more rugged, a little more eye catching, and still perfectly appropriate. This one is possibly even more versatile. 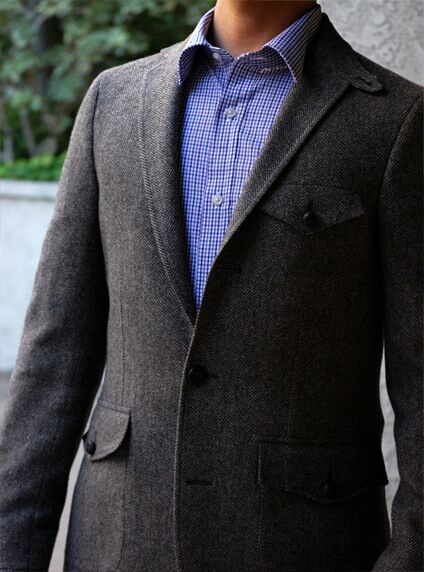 Introducing the Herringbone sport coat. 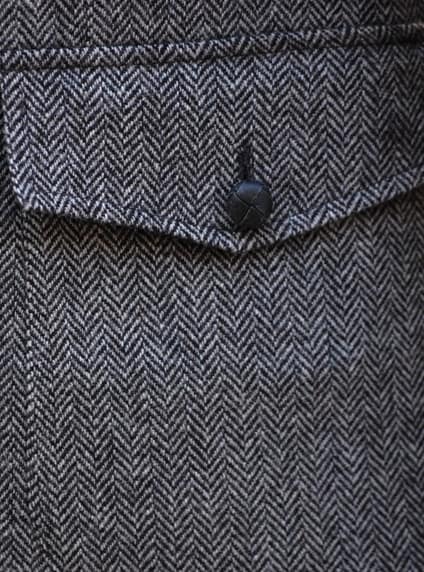 Herringbone is one of the safest ways to go for guys who are wary of getting too busy with patterns. (Check out the other 9 Patterns Every Man Should Know.) Herringbone can be worn in lots of different colors but if you’re still getting used to the idea of partners stick with gray like this version from Land’s End Canvas. It’s a great casual but well-put-together look for a fall date or just tooling around town. This model has several country inspired features like button flap pockets, a riding collar originally inspired by Englishmen for hunting and horseback riding, thick leather buttons which add to its causal feel, and it’s made out of a hearty wool. Last but not least functional buttons on the cuffs add a bit of high tailored class and sophistication and makes it easier to roll up your sleeves. This model comes with a three button stance with a rolled lapel. 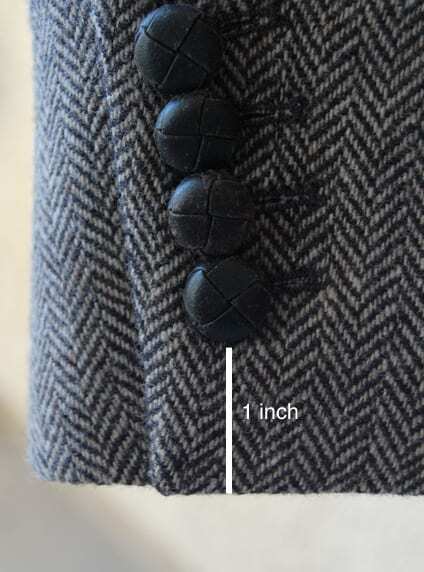 A three button jacket closes higher and in this case gives the jacket more of an outerwear piece feel. The interesting part of this rolled model is that it can still be worn like a two button jacket giving you a more polished look. So, it’s like getting two jackets in one. Keep it casual. 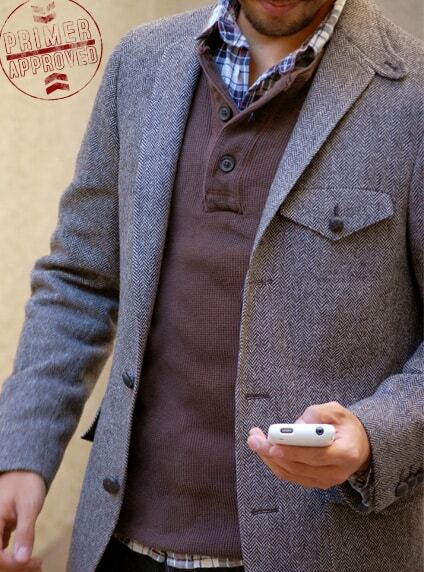 The herringbone pattern, pocket flaps and extra details make this a casual jacket. Keep it that way and wear some good looking jeans. We’ll tell you how later. It’s still a sport coat, which means you can use it to dress up a getup for a date, without looking like you’re dressed for a wedding rehearsal dinner. Layer up. 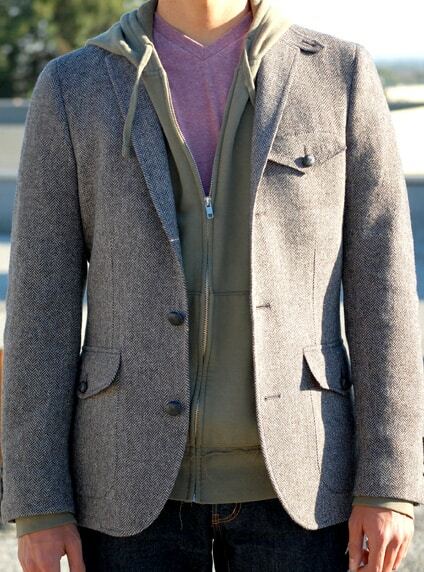 This jacket looks best with multiple layers. An Oxford shirt and shawl collar sweater will do the trick. Rock some boots. This jacket works great in the wild and the best footwear for wilderness pursuits are your trusty boots. You’ve got some don’t you? If not, try these. Is this one by The Gap not casual enough? LEC is a tad expensive for my budget right now. Hey Chris, Great find! The buttons and collar are different but it looks pretty nice too. If you pick it up, let me know. @Chris- Here’s an alternative option. Kmarizo, It is from this season, so it should be available in stores. It’s not available online unfortunately. 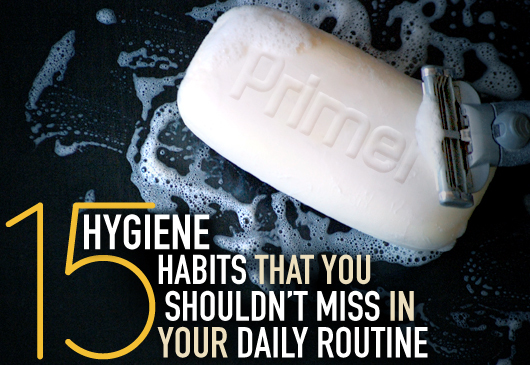 Thanks for sharing this great article. I really like the coat it looks nice and it also looks like a very comfortable coat. 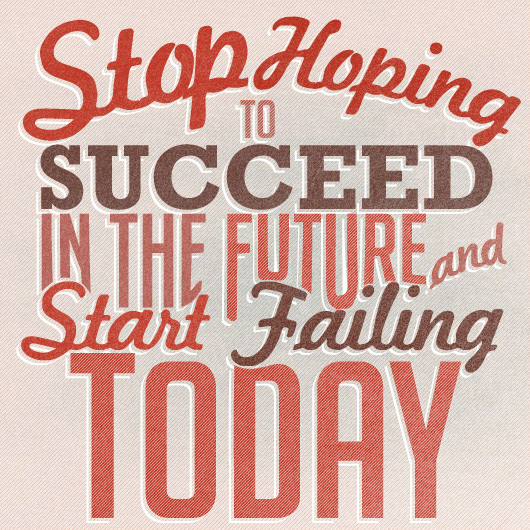 Keep on the good work! Just purchased the jacket. Absolutely love it. For those concerned about the price, search around for Lands End or Lands End Canvas Coupons.. I got mine for 50% with free shipping. Awesome! Glad you liked it, and thanks for the coupon info. I just picked up the sportcoat from Gap mentioned by Chris C. Great coat for the price which I must say is RIDICULOUS. I paid a mere $41 for it :O. Once again taking serious advantage of Gap’s incredible deals. I would splurge more on such a key piece of menswear, but being an undergrad doesn’t sit to well with the finances. Thanks for the great article and tips. You gents are Primer rock! This jacket is on sale now for about 100 off original price. Check it out! The Lands End one isn’t made anymore. Can anyone recommend a similar one from another company?